1 of 3 Heat broiler. Line a large baking sheet with aluminum foil. Toast rye bread under broiler for 3 minutes, turning once. Set aside. 2 of 3 In medium-size bowl, combine tuna, mayonnaise, celery, carrots, pickle relish, hot sauce, salt and pepper. Stir until blended, then taste and adjust seasonings, if needed. 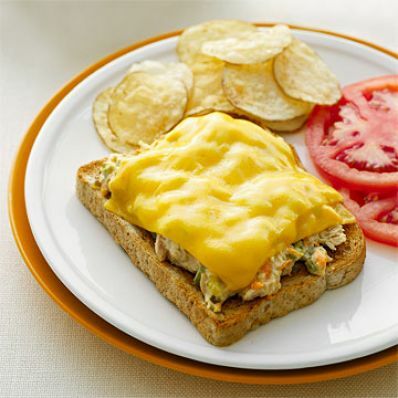 3 of 3 Spread a scant 1/2 cup tuna salad onto each slice of rye toast. Top each with two slices of cheese. Return to broiler; heat 3 minutes, until cheese is melted and lightly browned. Serve one open-face melt with sliced tomato on the side. Per Serving: 28 g pro., 361 kcal cal., 994 mg sodium, 3 g fiber, 17 g Fat, total, 24 g carb., 5 g sat. fat, 59 mg chol.